This collection contains selected materials that hold historical and cultural significance to the African American community and represent its longtime presence at Clemson University. Resources included in the collection are from the University Archives that span from 1828 to the present day. 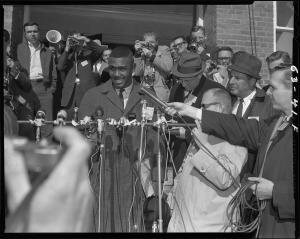 These include photographs, manuscripts and records from multiple collections related to: Harvey Gantt, Clemson’s first African American student who desegregated the university on January 28, 1963. This is an ongoing project and we have many more materials to include in the collection. We hope to include original materials (photographs, manuscripts, audio, video, oral histories, records) that document African American life, work, history, and culture at and around Clemson from residents of the Upstate region and those who in some way were part of the ongoing experience.